BEIRUT, Lebanon — Rebels stormed a police academy near the Syrian city of Aleppo on Sunday, the latest in a string of gains in the country’s north using weapons seized from the Syrian military. Turning President Bashar al-Assad’s own armaments against him, the rebel Free Syrian Army (FSA) used captured tanks to launch a fresh offensive on the compound in Khan al-Asal on the outskirts of the city. Opposition fighters took control of all four buildings in the complex, but clashes continued to rage, according to the Local Coordination Committees (LCC), an opposition activist network. The capture of the compound, a target of rebel attacks for months, would deal a damaging blow to the Assad government after a series of strategic losses in recent weeks. It has lost control of two military bases near Aleppo’s international airport and key infrastructure installations, including an oil field and the country’s largest hydroelectric dam. The heavier fighting, including the Syrian military’s increasing use of Scud missiles, coincides with widening divisions among the political opposition and rebel groups. Splits within the U.S.-backed Syrian Opposition Coalition threaten to derail Secretary of State John F. Kerry’s first strategy session with the group, set to be held this week in Rome. Syrian opposition leaders are under pressure to boycott what leading rebels see as a pointless talkfest that is unlikely to yield more weapons or other tangible support. 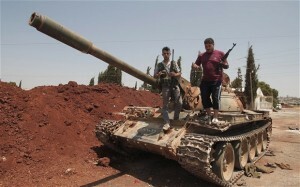 Weapons seized from Syrian military bases have helped the rebels build momentum. A video posted online Sunday by an opposition news site showed a tank being used by rebels to fire shells at the Khan al-Asal base. In fighting Sunday night, the Syrian army attempted to wrest back control of the compound, killing at least five FSA combatants, according to the LCC. The military used warplanes to drop barrel bombs in the vicinity, the group said. The Assad government has also flexed its military might with the use of Scud missiles, firing three on Aleppo last week and killing as many as 58 people. Another landed on agricultural land outside the city Sunday, according to opposition activists. A political solution has appeared increasingly distant since the Syrian Opposition Coalition said it would pull out of talks in Moscow and Washington, in addition to threatening to boycott the upcoming summit in Rome of the Friends of Syria group that Kerry is to attend. The coalition’s move effectively abandons its leader’s initiative to engage in negotiations, an offer that had caused deep rifts within the organization. The group said the pullout was to protest the “international silence on the crimes committed every day against our people.” The conflict, which began nearly two years ago, has claimed more than 70,000 lives, according to the United Nations. The United States is lobbying the coalition to come to Rome, sending envoy Robert Ford to Cairo on Sunday to press the case with opposition leaders there. The divisions within the opposition coalition are especially troubling to U.S. officials. Kerry’s predecessor, Hillary Rodham Clinton, helped organize the coalition, which the Obama administration endorsed late last year as the rightful representative of the Syrian people. The United States has refused to provide the opposition with heavy weaponry on the grounds that weapons could too easily be obtained by those who might use them against U.S. interests or Israel. The Obama administration is providing communications equipment, intelligence and humanitarian aid. Britain is Kerry’s first stop on a lengthy inaugural trip as secretary that is heavily focused on the war in Syria. Journalists covering the civil war are also paying a heavy price. Olivier Voisin, a 38-year-old French freelance photographer, died Sunday of wounds he suffered when he was hit by an exploding shell four days ago. His death raised the toll of journalists killed in Syria to 21, according to the advocacy group Reporters Without Borders, making the country the most dangerous in the world for media professionals. In a sign that the conflict is increasingly destabilizing the region, Lebanese President Michel Suleiman called on Syria to stop firing across the border. He made the appeal Sunday after three Lebanese were killed over the weekend, including the son of a former lawmaker. The Syrian Mujaheddin so far punish Bashar Al-Qaeda with his own Russian Made weapon. From Ak47 ,Tank,DHSKA AA gun, Cobra missile etc. The only exceptions are home made grenade,small Missile and IED. Assad has plenty of arms which will be distributed among the Lebanese and Iraqi Mujaheddin after the total defeat of Assad. Hezbushaitan and Nuri Al Maliki will taste some of them. Seeing though you love reporting so much, Here is one for you, did you see how 2 days ago approximately 150 terrorist animals had blown themselves up when they were attempting to make a bomb for a suicide attack. It was quite funny seeing their splatted bodies all over the place. However the best one Iv’e seen is when one of these terrorist pigs was dying and another was over his head asking him whether or not he can see the virgins. That one is defiantly one of my favourites. Got to love the MujahJOKES, hey Wargame. Seeing though you love reporting so much, Here is one for you, did you how 2 days ago approximately 150 terrorist animals had blown themselves up when they were attempting to make a bomb for a suicide attack. It was quite funny seeing their splatted bodies all over the place. However the best one Iv’e seen is when one of these terrorist pigs was dying and another was over his head asking him whether or not he can see the virgins. That one is defiantly one of my favourites. Got to love the MujahJOKES, hey Wargame.